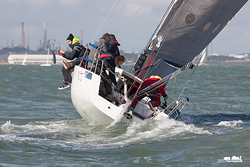 Despite a pessimistic forecast, oilskin-swaddled crews competing in the Hamble Winter Series enjoyed a day of champagne sailing – with only a few rain squalls to remind them that Autumn is setting in. 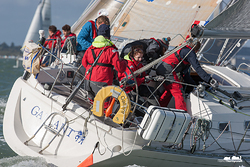 Competitors appreciated the opportunity to test their skills: John Noe, owner of La Nef IV, sailing in IRC 3 commented: 'We thoroughly enjoyed the 2 courses yesterday. The first took us to the Royal Thames mark which the winter series rarely uses. This gave us a good beat and some fast fetching in the breeze'. 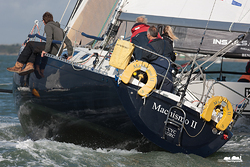 There was some close racing in all classes – with some split-second finishes in IRC4, where Impala 28s Imptish and Two Frank finished three seconds apart on elapsed time and exactly equal on corrected. In the J/88s there was an even closer finish, with Raging Bull and J-Dream crossing the line exactly abreast for an equal fourth place. In IRC 1, the fleet was extremely close, and despite two boats over the line in the second race the fleet fought all the way to a very tight finish, with only 4 seconds separating 3rd and 5th. After a close and busy day on the water, it was Roger Bowden's King 40 Nifty scored a first and a second, leaving them atop the podium overall. 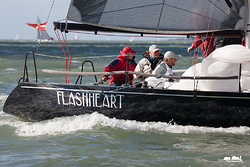 Christopher Daniel's J/122 Juno moved up the leaderboard with a 3rd in the first race and a comfortable win in the second race, while Philip Farrands' Humphries 40 Old Mother Gun scored a second and a fifth, putting them in third overall. Richard Patrick's First 40 Dusty P completed the podium in the final race of the day. 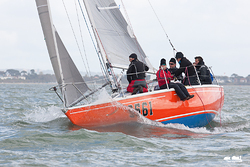 In IRC 2, Winter Series stalwart, Mike Bridges' Elan 37 Elaine made the most of the conditions to take two comfortable bullets. Elaine finished ahead of Simon Perry's J/109 Jiraffe and Mike Moxley's HOD35 Malice, who scored a second and a third apiece. That leaves Jiraffe second and Malice third overall in the series so far. 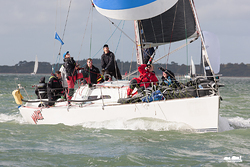 IRC3 leaders, Robin Stevenson's J/92S Upstart scored a 3rd and a 4th this week – but it was Jamie Muir's SJ320 Scarlet Jester and Annie and Andy Howe's J/97 Blackjack II who took a race each. 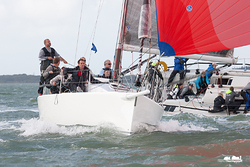 David Greenhalgh's J/92 J'ronimo filled in the gaps with two solid second places. Revelling in the conditions, Giovanni Belgrano's classic Laurent Giles-designed Whooper won both races by over minute on corrected time in IRC 4. Behind her, John Danby's Mustang 30 Respect and Toby Gorman's Sigma 33 Stan the Boat scored a second and a third each. That moves Stan to the top of the overall results – but much will change when a discard kicks after next week's racing. 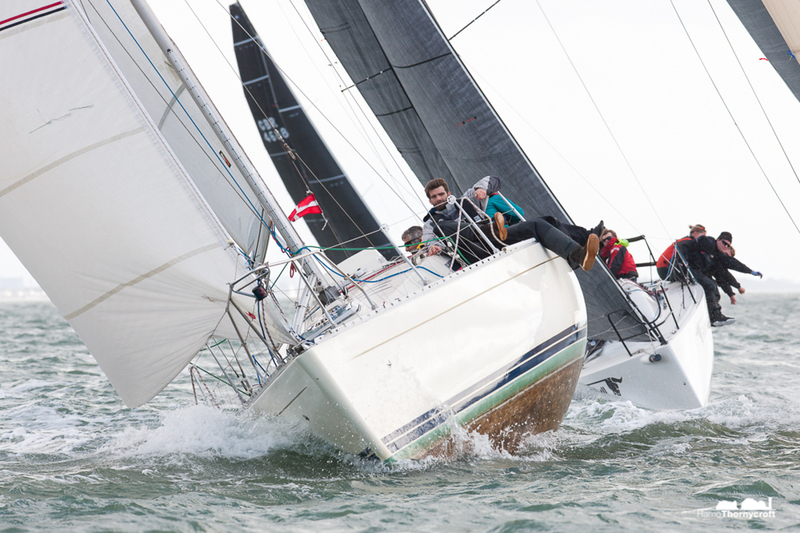 In the one-design J/88 class, experience paid off for Paul and Marie-Claude Heys' Jenga as they scored two comfortable first places – which moves them closer to the top of the leaderboard. Class captain Paul Ward and crew on Eat Sleep J Repeat and Kirsty and David Apthorp on J-Dream scored a second place each. At a packed prizegiving in the HRSC clubhouse, supported by Wadsworth, Stuart Childerley announced the day's special prizes: the 'Top Dog' award, which rewards the best corrected time/distance sailed – which this week went deservedly to Whooper. 'They really know how to make that boat go in these conditions, and were head and shoulders above the rest of the fleet this week,' commented Stuart. 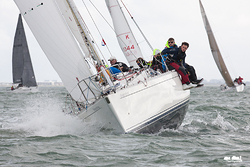 Best Start this week went to the J/111 Kestrel. 'They had a perfect time on distance run and nailed the first start, bang on the line,' said Stuart. Well done to all competitors and race team volunteers for braving the rain for an unexpectedly sunny day on the water – and we'll see you all next weekend! 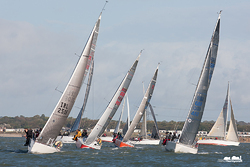 Winter Series crew party on Saturday 22 October - tickets are £15 from the HRSC office.